The last days of February 2019, was one of the frostiest times witnessed this year. 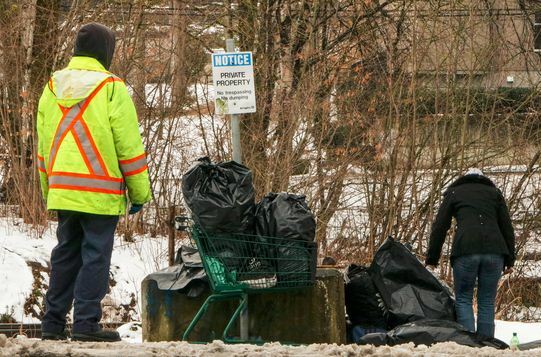 Yet this was the time, police, bylaw enforcement officers and fire officials conducted a raid on the Anita Place tent city in Maple Ridge, B.C., housing homeless people, to seize heaters and propane burners which the residents used to keep themselves warm. The city also cut off heat and electricity while conducting the sweep, leaving these essential amenities available in only the one tent municipally-sanctioned to serve as the warming tents for Anita Place residents. Needless to say, a lot of residents were left to endure the biting cold with no way to warm themselves. This raid was condemned by an activist group that represents camp residents, theAlliance against Displacement. The group said the raid was a government move aimed at freezing homeless people out of Maple Ridge. It is easy for the group, and others to think this way because Maple Ridge has never been accepting of its homeless population. It had always stood against shelters and modular housing projects especially if the housing projects did not demand residents to be sober or drug-free to gain entry. The first ever modular housing project was approved under former mayor Nicole Read, and this decision was massively protested to the point that there were questions about the former Mayor’s safety. The activist group insists that Anita Place is too full, too small and not suitable for everyone in the city’s one and only 53-unit modular housing complex, even as the city keeps saying that there are warm beds and meals available for everyone in the camp.If the city’s account is true, then why do the residents have to make do with tents and illegal electrical connections? The city's reasons for the recent raid in the camp is, however, worth paying attention to.The sweep was made necessary by the discovery that someone had tampered with the electrical and propane supplies. The sweep was ordered by a B.C. Supreme Court justice who was trying to prevent another fire outbreak. On the 30th of December 2018, a tent in the camp had caught fire and a womanwas treated for smoke inhalation and burns to her hands and feet. In the last two years, the shelter has witnessed seven fires.One of them occurring just a few days before the raid. “To risk freezing or burning is a choice no one should have to make,” Justice Christopher Grauer wrote. The Globe and Mail tried to interview newly elected Mayor Mike Morden for his views but he refused, probably because he could not speak on the matter as the clean-up injunction is under appeal. He had earlier this month, won a B.C. Supreme Court injunction order, which gave the city authority to address fire safety issues in the camp on 223rd Street.